Your 4 day UK tour will begin at the famous King’s Cross station where all Harry Potter fans would know that Hogwarts Express departed from! Your first stop will be to the historic Durham where you can check into your idyllic 4 star hotel before whetting your appetite with a traditional British lunch. Try the Undercroft restaurant located in Durham Cathedral’s medieval undercroft – the perfect place to eat and soak in the rich history of this famous city! 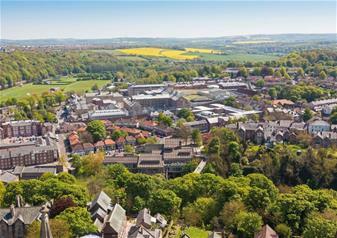 Be sure to enjoy sensational sights of Durham Cathedral’s grounds. Known as one of the most plush and lavish cathedrals in Britain, it has unforgettable beauty in abundance. Get your camera out and get snap happy with the perfect Insta-stories available! Head inside for the fascinating state-of-the-art exhibition gallery and see if you can recognise the cloisters used in the Harry Potter film franchise! Your 2nd day will be in the famous city of York. York once played a vital role in the course of British history with the War of the Roses deciding the fate of the monarchy. The House of York fought vigorously against the House of Lancaster to bring their heir, Edward, to the throne. Discover all of York’s rich royal history with free leisure time in this unforgettable city. Enjoy a trip to Whitby Abbey Clifford’s Tower, dating back to 13th century and built for King Henry III. Soak in spectacular sights of York with one of the best viewpoints in the city. Once you’re in the mood for learning, try out Whitby Abbey which inspired Bram Stoker’s world-famous tale of Dracula! Full of drama and bloodied terror, this is the perfect location to test your nerves! The afternoon of your Treasure Trove tour will take you to the fascinating Jorvik Viking Centre taking you back in time to reveal the treasures of the past! Discover the famous and most shocking discoveries of modern archaeology including excavations. Enjoy a fully immersive visitor experience taking you through the reconstructed Viking-age streets as you experience 10th century York like never before. On your last day, you’ll get to visit the iconic Lincoln Castle. Why is this castle one of the most famous in the UK? It holds the last surviving copy of the 13th century Magna Carta! Come up close to this historic document to see how it changed the course of history and henceforth, making Lincoln Castle one of the UK’s most stand-out landmarks. At the end of your tour, board your train back to London! Please check the terms and conditions of Brit Rail Pass before travelling.